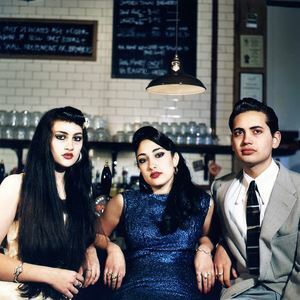 Kitty Daisy & Lewis are a three-piece band comprising the teenage siblings of the Durham family. Their music is influenced heavily by R&B, Swing, Jump blues, Country and Western, Blues, Hawaiian and Rock 'n' Roll... The trio are all multi-instrumentalists playing guitar, piano, banjo, lapsteel guitar, harmonica, double bass, ukulele, trombone and accordion between them. Kitty Durham is the youngest of the group and primarily sings and plays drums, harmonica, ukulele and guitar. Lewis Durham is the middle child who sings and plays guitar, piano, banjo, lapsteel and drums. He collects and plays/DJ's 78rpm records and has built a home studio for the band to record in. Kitty, Daisy and Lewis do not like to use computers or any digital format during the recording process. Daisy Durham is the eldest of the group, primarily singing and drumming with piano also. They live in Kentish Town, north London and attend/attended Acland Burghley School. The band are signed to the Sunday Best record label who released their second single Mean Son Of A Gun, a song originally cut by Johnny Horton in the 50s. This was released on 45rpm, CD and a limited edition 78rpm vinyl. The tracks were recorded at home. The vinyl was also cut by Lewis using his own equipment (though possibly at The Exchange Mastering Studios, which is owned and run by his father Graeme). They have supported artists such as Mika and Razorlight at London's Earls Court Arena. They also played the main stage at Bestival in 2006 and played twice at Glastonbury in 2007. They have featured in Vogue and performed on Blue Peter. When performing live their parents, Ingrid Weiss and Graeme Durham, play double-bass and guitar respectively. Ingrid Weiss is the former drummer of The Raincoats and was made to play the double bass by Kitty Daisy and Lewis.